On one of our first days of class, Nejla Yatkin (NY2Dance) opened her Modern Repertory class by asking the young dancers, “What does dance mean to you?” Passion, life, escape, communication, satisfaction, home, transformation, freedom, purpose, understanding, trust and beauty were some of the answers they came up with. This question came back around yesterday, during Nejla Yatkin/NY2Dance’s Show & Tell lecture demonstration at Schaeffer Theatre. For Nejla, dance starts with love. She explained that growing up in Germany she practiced contemporary and modern dance that emphasized not how you are moving but why you are moving. She continues to ask this question in all of the work she builds. 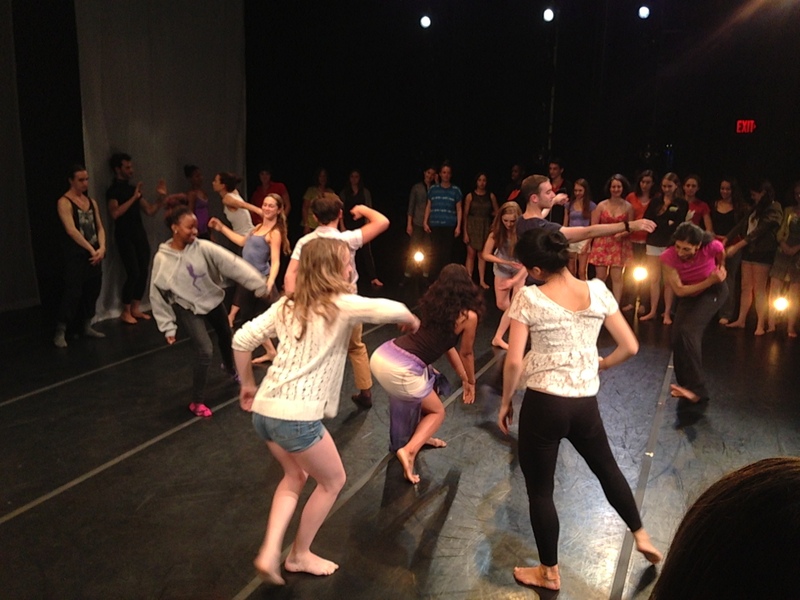 Nejla draws everyone up onto the stage for an improvised dance. Her newest work, Oasis tackles some big issues. Influenced by her experiences in Berlin during the Cold War, Nejla became interested in the revolutions taking place in the Middle East. Political systems breaking down and the struggle to find freedom reminded her of the demonstrations she grew up around in Germany. After immersing herself in research she began to wonder what it was like for the women dealing with these issues. She felt their voices were lacking and wanted to bring their experiences to life. Drawn to the Persian love story Layla and Majnoon, a forerunner to Romeo and Juliet, she created a work that explores fear, loss, humanity and spirit. 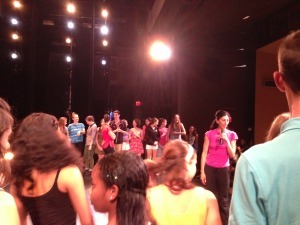 One by one everyone was given a chance to dance on stage with the company. While this work deals with a specific subject matter, it is the emotions conveyed that are universal. As the work has toured around the world, people have shared how much the themes of love, pain and revolution have resonated with them. Even the music, created by Maine-based Persian composer Shamou, melds sounds from classical Persian music along with European and African influences to create a global sounding score. The evening closed with an invitation to the stage. Our young dancers, along with the Lewiston community, got up to move and improvise together. A true melding of arms, torsos and legs gave us a sense of connectivity at the end of the night. You can purchase tickets to this weekend’s show of Oasis on the BDF website. 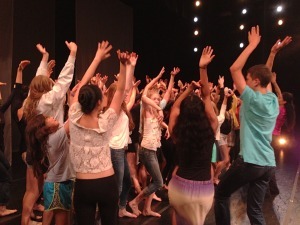 Everyone ended up in the center dancing together!